I’m not much of a baker so we feast on store-bought hot cross buns every Easter. No shame. 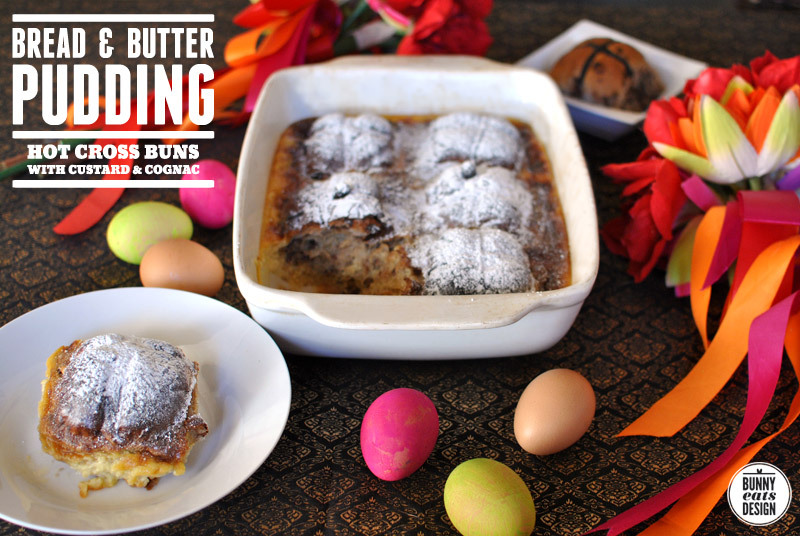 If you’re itching for something a little fancy this Easter, I recommend trying this version of bread and butter pudding. This recipe serves six adults (or two giant gluttons with regret). Pre-heat oven to 170°C / 325°F. In a large pot, bring the milk and cream to just before simmering point. Cut the vanilla pod in half and scrape out the seeds into the pan. In a bowl, whisk the eggs with sugar until pale, then pour egg and sugar mix into the pot. Add 1 tablespoon of Cognac and mix. 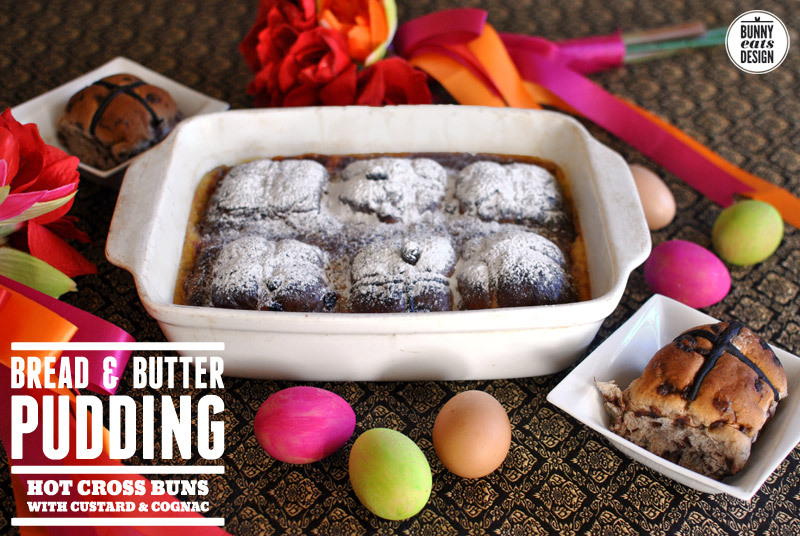 Rub the bottom of a casserole dish with butter, then lay the bottom halves of the hot cross buns in the dish, scattering the sultanas on top. Arrange top halves of the hot cross buns on top and the remainder of the sultanas. Pour the custard mix into the casserole dish and leave to soak for at least 15 minutes. Cooks treat: save ladle’s worth of the custard mixture, add a teaspoon of Cognac and enjoy. Place the dish in a deep roasting tin, half-fill the tin with boiled water and bake for 45 minutes, checking towards the end to make sure it doesn’t burn. 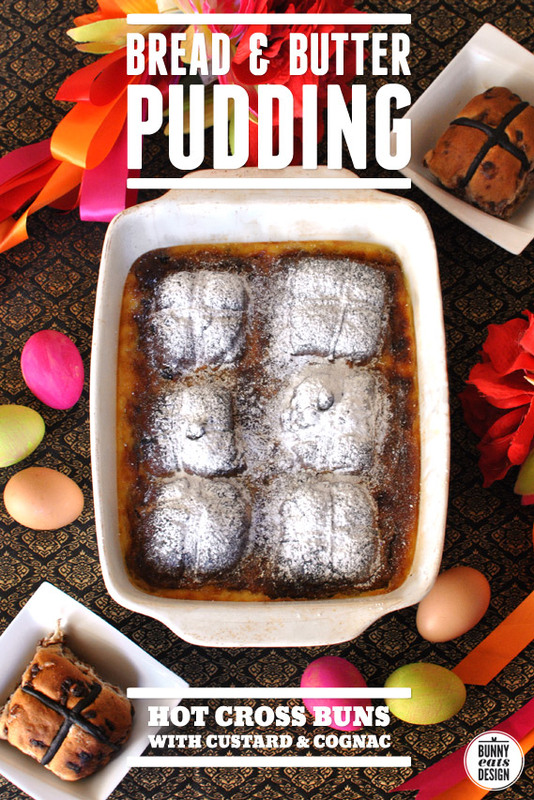 The pudding will have a slight crust and be slightly wobbly inside. Dust with icing sugar. Icing sugar can hide a multitude of sins. Serve with thickened cream. *To make thickened cream: pour 1-2 cups of cream into a bowl, then whiz a stick blender through it for 5-10 seconds. The buns look incredible. I’m going to have to find one of those bakeries. Hi Eva! I hope there is a Bakers Delight close to you. Oh my crap you are such an evil genius. Previous PostTofu Tuesday: The Zomato Easter Egg hunt!